We had a lazy Sunday today and I had some time to play. I've been inspired by all the entries to Linda's Grungy Monday challenge - Wearable Art this week, but it's something totally out of my comfort zone. So, today instead of playing it safe, I decided to take the challenge and try something new. I figured a pin or brooch would be the most straightforward thing to attempt. So, this is what I created on a piece of 2.5" x 2.5" grunge board. 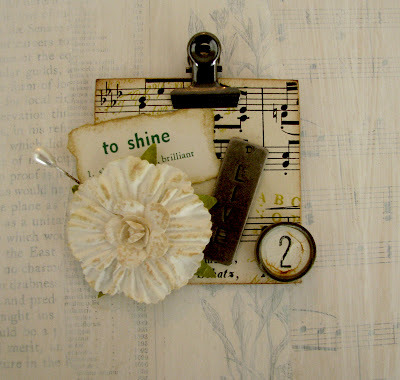 The grunge board is covered with a piece of sheet music and some stamping. I added an aged paper flower with a vintage hat pin, one of Tim's word sticks and hing clips. I finished with a vintage flash card and typewriter key. There's a little metal pin on back, but I don't think you need to see a picture of that! Everything was adhered with soft or heavy weight gel medium. This is wonderful! You've given me some inspiration --- I've never tried wearable art. I think it's time to create some... it. Awesome brooch. Lovely as usual. Fun project! I like the idea of the brooch and love the flower! I love it!! So grunge and vintage, nice and cool idea to make a brooch. Oh it is stunning! I am so behind that I have never tried any grunge. I'll have to give it a shot someday. With you as my inspiration I just may succeed. Ali, this is absolutely gorgeous! I love your clever approach to the wearable art challenge-- it's elegant and a read conversation piece! And... congratulations! You won the Grungy Monday 37 prize! You'll see an email from me shortly. Wonderful pin, Ali! Very creative - love the big clamp holding it all. This is just amazing Ali!! A beautiful brooch!! So cute - hope you wear it and get loads of lovely comments! I really love your pin! It's so cute! Wonderful design!